Providing ample seating for your friends and family is the Laertes Collection. 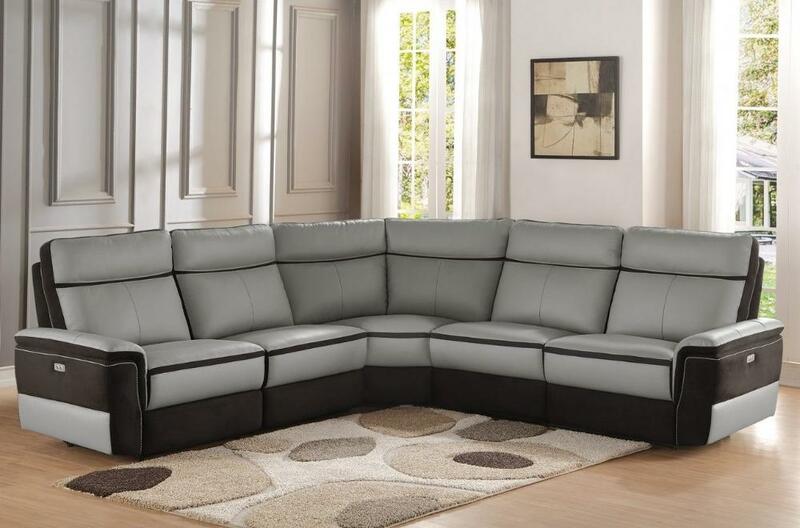 The classic sectional shape is book-ended by stationary chaise options or USB port enhanced end power recliners. Taupe gray top grain leather provides a gentle touch while darker tone fabric lends stark contrast. The power reclining mechanism bring you to your desired position with a touch of the button. The collection is available in several different configurations to choose from to complete your seating arrangement. Note: Armless Chair can be replaced by Power Armless Reclining Chair within configurations. FEATURES: Taupe Grey Color ~ Contemporary / Transitional Style ~ USB Port ~ Dual Power Reclining Ends ~ Top Grain Leather / Fabric Cover ~ Configurable To Needs.